8-bit based, bit-serial, made from standard TTL components. The Intel 8008 was a nearly 100% compatible, but 8-bit parallel, LSI implementation. The Datapoint 2200 was a mass-produced programmable terminal, designed by Computer Terminal Corporation (CTC) founders Phil Ray and Gus Roche and announced by CTC in June 1970 (with units shipping in 1971). It was presented by CTC simply as a versatile and cost-efficient terminal for connecting to a wide variety of mainframes by loading various terminal emulations from tape rather than being hardwired as most contemporary terminals, including their earlier Datapoint 3300. However, enterprising users in the business sector (including Pillsbury Foods) realized that this so-called "programmable terminal" was equipped to perform any task a simple computer could and exploited this fact by using their 2200s as standalone computer systems. Its industrial designer John "Jack" Frassanito has later claimed that Ray and Roche always intended the Datapoint 2200 to be a full-blown personal computer, but that they chose to keep quiet about this so as not to concern investors and others. Also significant is the fact that the terminal's multi-chip CPU (processor) became the basis of the x86 architecture used in the original IBM PC and its descendants. The Datapoint 2200 had a built-in full-travel keyboard, a built-in 12-line, 80-column green screen monitor, and two 47 character-per-inch cassette tape drives each with 130 kB capacity. Its size, 9 5⁄8 in × 18 1⁄2 in × 19 5⁄8 in (24 cm × 47 cm × 50 cm), and shape—a box with protruding keyboard—approximated that of an IBM Selectric typewriter. Initially, a Diablo 2.5 MB 2315-type removable cartridge hard disk drive was available, along with modems, several types of serial interface, parallel interface, printers and a punched card reader. Later, an 8-inch floppy disk drive was also made available, along with other, larger hard disk drives. An industry-compatible 7/9-track (user selectable) magnetic tape drive was available by 1975. In late 1977, Datapoint introduced ARCnet local area networking. The original Type 1 2200 shipped with 2 kilobytes of serial shift register main memory, expandable to 8K. The Type 2 2200 used denser 1 kbit RAM chips, giving it a default 4K of memory, expandable to 16K. Its starting price was around US $5,000 (equivalent to $31,000 in 2018), and a full 16K Type 2 2200 had a list price of just over $14,000. The 2200 models were succeeded by the 5500, 1100, 6600, 3800/1800, 8800, etc. The original design called for a single-chip 8-bit microprocessor for the CPU, rather than a processor built from discrete TTL modules as was conventional at the time. In 1969, CTC contracted two companies, Intel and Texas Instruments, to make the chip. TI was unable to make a reliable part and dropped out. Intel was unable to make CTC's deadline. Intel and CTC renegotiated their contract, ending up with CTC keeping its money and Intel keeping the eventually completed processor. CTC released the Datapoint 2200 using about 100 TTL components (SSI/MSI chips) instead of a microprocessor, while Intel's single-chip design, eventually designated the Intel 8008, was finally released in April 1972. 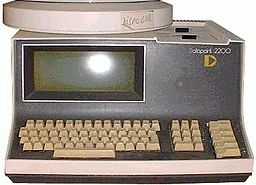 Even though the Datapoint 2200 operated one bit at a time as a serial computer, the DataPoint 2200 performed faster than the 8008 chip. Possibly because of their speed advantages compared to MOS circuits, Datapoint continued to build processors out of TTL chips until the early 1980s. Nonetheless the 8008 was to have a seminal importance. It was the basis of Intel's line of 8-bit CPUs, which was followed by their assembly language compatible 16-bit CPUs — the first members of the x86 family, as the instruction set was later to be known. Already successful and widely used, the x86 architecture's further rise after the success in 1981 of the original IBM Personal Computer with an Intel 8088 CPU means that most desktop, laptop and server computers in use today[update] have a CPU instruction set directly based on the work of CTC's engineers. The instruction set of the highly successful Zilog Z80 microprocessor can also be traced back to the Datapoint 2200 as the Z80 was backwards-compatible with the Intel 8080. More immediately, the Intel 8008 was adopted by very early microcomputers including the SCELBI, MCM/70 and Micral N.
The original instruction set architecture was developed by Victor Poor and Harry Pyle. The TTL design they ended up using was made by Gary Asbell. Industrial design (how the box's exterior looked, including the company's logo) was done by Jack Frassanito. CPU: 8-bit, made from standard TTL components. The Intel 8008 was a nearly 100% compatible LSI implementation. ^ Datapoint 2200 Reference Manual Version I and Version II (PDF). Datapoint Corporation. 1972. ^ Thompson Kaye, Glynnis (1984). A Revolution in Progress - A History to Date of Intel. Intel Corporation. p. 13. Order number:231295. "The 8-bit 8008 microprocessor had been developed in tandem with the 4004 and was introduced in April 1972. It was originally intended to be a custom chip for Computer Terminals Corp. of Texas, later to be known as Datapoint." "As it developed, CTC rejected the 8008 because it was too slow for the company's purpose and required too many supporting chips." ^ a b Ken Shirrif. "The Texas Instruments TMX 1795: the first, forgotten microprocessor". ^ Dalakov, Georgi (April 23, 2014). "History of Computers and Computing, Birth of the modern computer, Personal computer, Datapoint 2200". ^ Wood, Lamont (August 8, 2008). "Forgotten PC history: The true origins of the personal computer; The PC's back story involves a little-known Texas connection". Computerworld, Inc.